What can I say ?… I felt the same as I wrote it !!! My Melia is just blossoming here too Valerie ( I am in Porirua). It is the loveliest tree and I have blogged about it in the past. Did you know that the beads are used, once dried, for rosary beads? I call it my spiritual tree now. I did not know that it was known as a Persian Lilac but the scent is lovely as you describe. I admire two at the moment as I drive down our street. IF I had space in the garden here I would have one or maybe two – they are lovely. As for cabbage tree flowers this season! Every single tree here is simply laden with the abundant heads. Their Maori name Ti Kouka is a prettier name than cabbage. Thank you for the scented garden tour! Thank you so much for all that lovely information.. Ti Kouka is so much more attractive, I agree – and yes, aren’t they flowering amazingly this year. What you said about the melia tree was so interesting… it’s such a lovely tree, and many people seem to know nothing of it. Valerie, your garden is so much more advanced than mine down here in the South; yours is what I look forward to but on a smaller scale. I adore Cambridge Blue petunias and, like you, love to have white in the garden to catch the light of the long summer evenings. I don’t have lilac but wish that I did. I rarely see it in anyone’s garden, these days. I discovered the other day that the ceoanthus is known as Californian lilac but I don’t think it has a perfume. For any age, fragrance in a garden is lovely but perhaps it is particularly important to have more scent as we age since there is a connection between brain cell renewal and the nose 🙂 Your gardening with Mr Appleby made me think of The Secret Garden 🙂 And guess what I am having for tea!!!!!! How interesting that brain cell renewal is linked with smell – I should be doing pretty well, as evey time I pass the roses, I stop to breath in their deep fragrance.! Hope you enjoy the peasant food !!!!.. The peasant food is being prepared at this very moment 🙂 Smells good. I am sure your brain is well nourished by the sights and sounds and scents of your garden. You paint a storybook picture of your friendship with Mr. Appleby. I can imagine the delicate watercolor illustrations of the nine-year-old girl wandering around the grounds with the weather-beaten man in his battered trousers. How sweet it must have been to learn the names of plants and flowers with him! Best of all, you were tasked with picking flowers and making bouquets for all the rooms. I can’t think of anything better for a nine-year-old girl. Sixty five years ago and you recall that summer with Mr Appleby – yes, we never know how we touch people and especially children. I retain fond memories of a garbage collector whom people shunned because of his job and the smell that hung around him. But he always had a kind word and smle for me. I so looked forward to seeing him hop off the truck, throw in the garbage and lope after the truck as it turned the corner. Lovely to hear from you Eric…. yes, the memories of those times are so vivid… your garbage collector could never have visualised being preserved in your mind and heart all those years ago… it’s always magic to me, the way we hold sweet memories of those who think they’re just passing through! Thank you for letting me walk beside you through the garden of your mind and heart and home. Mr Appleby lives on now in my mine and your reader’s minds. 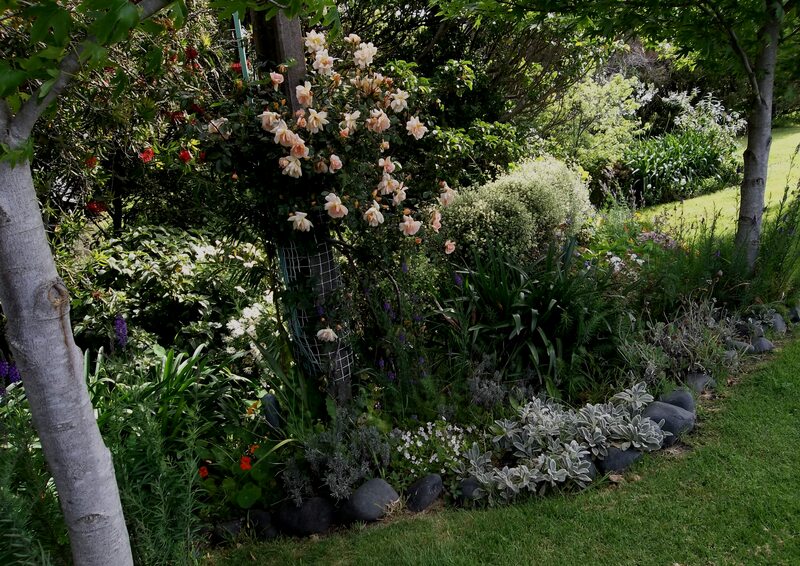 His love of nature augmented your natural desire to bloom in tune with it as a young girl and now, in far off New Zealand, it still grows freely, thriving even as your garden does. Oh, to be a plant in your care. Never lonely, always loved, in the company of friends aware on a level we humans can only barely comprehend that they are in a good place. I so love to read your posts for they are so much more than the usual fare enthusiastically promulgated all through the blogosphere. It was a lucky day for me when I was found by you. Dr. de Pomiane’s concoction sounds good. I’m off the mountain for a few days and hungry for real food. Will give it a try. Thank you for sharing your sentsasions and allowing me to follow along. Thank you so much for commenting – glad you enjoyed the story…. having trouble with the computer, so if you got a message that wasnt for you, apologies! Valerie, Mr. Appleby has been an awesome and life long teacher to you. I wish all children are blessed with a Mr. Appleby. May he come as a gardener, a teacher, a painter, a cook or just somebody who reads aloud or tells stories. If every child has one Mr. Appleby to instil a lifelong passion and love for learning, or enjoying (an aspect of) live; the world will be a happier place. And lets vice versa this too. Mr. Appleby must have been enchanted by you. I can picture this lovely girl eager listening to him. He doesn’t think much of himself, but this young girl becomes his apprentice. How unexpected and joyful! He isn’t even sure he is really teaching or hoping your love for gardening will last, but he gives it a change. You return day after day, week after week and, as a result, you both grow happy. You have been a gift to him, as much as he to you. I love all these snippets of reminiscence and information. Things one didn’t realise one needed to know more about until you clarify them, like beck, fell and scar. Truman displayed the American brashness which equates sensationalism with creating something memorable. The old English custom of boiling everything to a mush is, however, a valid failing. Thank you, lovely to know you noticed those words! ‘Yes, to Truman… and yes to that( I hope) dying habit of overcooking the vegetables!What a waste of power! My parents were enlightened, so it was only at school that I suffered from them !!! Thank you for sharing your joy of gardening and sweet memory with Mr. Appleby. Love the photo of your garden. Thank you Amy, lovely to hear from you.. glad you liked the pic – the telegraph pole on the road – I garden all the council land!! Oh, I miss lilacs terribly! The last time I saw lilacs which were not cut branches was when I was in Banff Canada and spent an afternoon running around like a fool with a videocamera following magpies on the lilacs. Just glorious! It seems that there are a lot of us lilac fans around ! I can see a Society for the dissemination of lilacs forming in Blogland !!! I wish it came with a permanent subscription to the scent and the texture. I loved the title of this post and the post itself was just as rewarding – luscious, sensual and evocative. Your descriptions of the garden were beautiful enough, but I loved the addition of Mr Appleby, who was memorably described and the thought of what we leave in the minds of children was a wonderful thought. As a child growing up in the mid-western part of the United States, we had two lilac bushes. Eventually, one was sacrificed to a widening driveway and the other shriveled and died. The scent of lilacs always transports me to a happy time of huge bouquets that filled the house or schoolroom with delicate fragrance. I’m filled with longing every spring but as yet have been denied another lilac bush. Perhaps this will be the year I’ll push the issue. Another fond childhood memory is Frances Hodgson Burnette’s “The Secret Garden” which I read repeatedly until I had whole passages memorized. Walking with you through your magical garden took me back to the happy times I spent with Mary Lennox. As winter approaches in my part of the world I think I will come back and for a visit to your garden, if I may. And perhaps I’ll linger and listen to young Valerie and her friend/teacher, Mr. Appleby. Dear Rachel, what a lovely evocative comment… there seem to be a lot of us lilac fans out there… amazing…I do think you should treat yourself to a lilac if they grow where you are – smelling the flowers is one of those permitted pleasures! Hey, you guys really DO have summer when we are beginning to freeze! Valerie, your garden reminds me of your kitchen, and your plants remind me of your dishes: everything so carefully noted, specifically known and cherished, named and invested with memory and meaning. I love the way in which the details of your everyday life honor and celebrate Life in its largest sense. I try to do that, but I just have not gotten the hang of it – yet. Mr. APPLEBY! A brick-walled garden! It is exactly how I pictured the Secret Garden as a child. Now that I think of it, I read a great deal of books for and about English children when I was a kid. I can’t recall all their names, but I think I was more of an Anglophile than I had remembered: I had a jumbled image of everyone going for walks to the Victoria and Albert on rainy days, wearing galoshes and complaining about having to look at some huge dollhouse (I forget) yet again. Then they’d walk home along the High Street to high tea, including potted meat, three kinds of biscuits, clotted cream, and several sorts of jam, with their nurses/governesses/nannies in schoolrooms that used to be their nurseries. They’d play Authors and board games after tea and argue about whose school uniform was the most beastly, but, because they all seemed to be feeling a big financial pinch, they were secretly glad that the problem of new school clothes had been settled. Oh well – enough about you. Let’s talk about me! The Secret Garden never entered my consciousness like it seems to have done with so many commenters… I didn’t read it until I was in my twenties, and then out of curiosity. As for over-dosing on all those Edwardian childrens’ stories – how I laughed – nothing like that in my shattered spartan childhood, gosh – several sorts of jam – not unless you had smuggled extra food points, and as for clotted cream – the stuff of dreams during the war. and after.. !!!!. So I know all about you too !!!! Hmm…almost all these kids were 20th century – 1940s and 50s, actually – odd, because there were many references to people getting on their feet after the war. Are you familiar with English children’s author Noel Streatfeild – Dancing Shoes, Theater Shoes, Skating Shoes, Travelling Shoes, etc.? Just curious. To the Young Yank: Mmmm, I think their writers may have been writing nostalgically… sort of twenties and thirties memories… the war turned everything upside down – especially as women under forty were conscripted unless they could prove they had pressing reasons like young children to look after – so few nannies, cooks etc left …. museums closed and their exhibits hidden in safe places … nothing was normal in those days…just enough coupons to buy school uniforms and and nothing else…and hardly any biscuits, and no sweets ( candy to you) Yes, I do remember the name Noel Streatfield, but I don’t think I read any of her books- my parents rarely bought me books – except Heidi and Little Women for Christmas and birthday – I managed on what was around the house, and also the sixpenny second hand books my father would pick up on a bookstall on his way home on Friday night – Lord Lytton’s Harold, Charles KIngsley’s Hypatia, Lytton’s Last Days of Pompei, Pickwick Papers, Westward Ho … strange reading for a ten year old, but my earlier reading had been even stranger! I tried to borrow other people’s books like ” Rupert the Bear”, but that was verboten, as was Enid Blyton who I used to try to get hold of secretly… No I didn’t take you seriously in your wonderful potted memories of Anglophile reading – but I did think it was rather funny that while you were reading them, I was reading all the stuff on America! Yes, I used to wonder what cookies were – and candy ! Love from an antipodean bibliophile! Your garden and your memories of learning about gardens are both delicious. I think I could enjoy my coffee in your garden with the lovely smells and brilliant pinks and whites. Thank you. Me? I have Lavender growing large in the backyard it withstands our Texas heat and blooms throughout the summer. Yes, you are very welcome to come and drink your coffee in the my garden, Val… but I am a little surprised that you only have lavender growing in your garden – no yellow rose of Texas??? I do not have a green thumb and I am not home enough to care for anything. Terrible I know. So my wonderful lavender and one Texas Hibiscus (the leaves look like marijuana) in honor of my most beloved step-mother. Both grow with no care. I was only joking Val, I just love that song !!! Your lovely post is a welcomed breath of fresh Spring air to me as I sit here in New Jersey and look at the orange and brown leaves falling from the trees. Thank you Shirley.. it’s our turn, having survived the winter! But I do love autumn too – my favourite season actually – sounds as though your autumn is as beautiful as ever…. I closed my eyes and I was there…walking with you in your garden and following you through the wonderful lush old house. It is cold here and starting to become bleak…I will book mark this post and read it at least once a month until our spring comes again! Hoo ray for spring for you! What precious memories…and how well you remember, Valerie! Mr Appleby would be gratified, I’m sure. Oh how I love the smell of jasmine! It struggles in my garden, but fortunately I’m able to have gardenias, my other favorite garden perfume, even if we have to bring it indoors to protect it from the harsh winter. Your garden looks so lovely, Valerie. Yes, jasmine is gorgeous, but gardenias are a ravishing substitute! I had forgotten about gardenias, and must get one… I’ve just acquired a daphne, – their scent in spring knocks my socks off!!! You have a beautiful garden Valerie and thanks for visiting my blog and the ‘likes’. Best wishes.